Raise a glass to local farmers and help support OXCM! 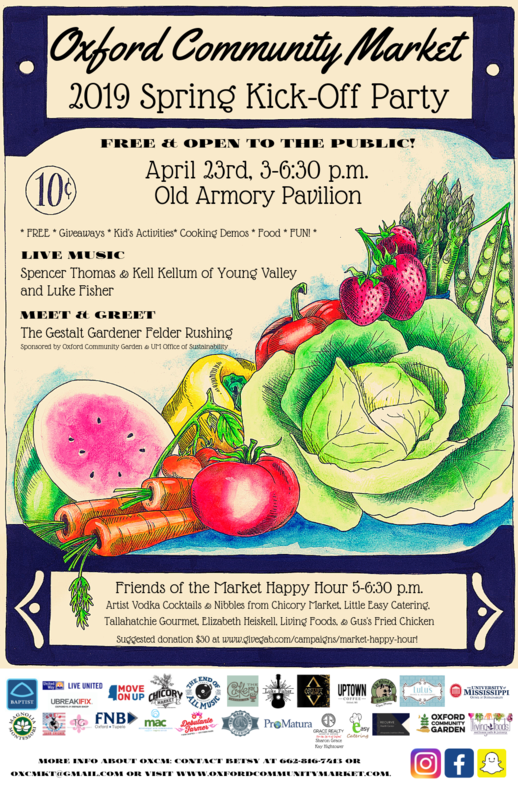 The purpose of the Oxford Community Market includes, but is not limited to, addressing food insecurity in Oxford, Mississippi. Its goal is to increase access to fresh food for local and regional community members. The Community Market connects growers and producers with customers, delivering affordable, regionally grown and nutritious foodstuffs. The Community Market promotes better health, social awareness, and public dialogues that drive a sustainable economic system for vendors, customers, the market, and the communities we serve. Oh, SNAP! - An incentive program that provides a dollar-for-dollar match, up to $10, to customers using SNAP benefits at the market to purchase fresh fruits and vegetables. WIC Farmers Market Nutrition Voucher Participating Market - We are Lafayette County's only redemption site for WIC Farmers Market Nutrition Program Vouchers. These vouchers may be used only for the purchase of fresh fruits and vegetables. *WIC is a supplemental nutrition program for women, infants, and children. The program is administered through the Mississippi Dept. of Ag and Commerce. OXCM Cares - A weekly fresh food drive that invites OXCM customers to donate local food from OXCM vendors to homebound residents of the CB Webb community.